Next week I am talking at Shibaura House’s Community Herb Garden talk event. Herbs can be used for flavor, food, medicine, and perfume. Even in small urban spaces, herbs are very tough and can be used in daily life. 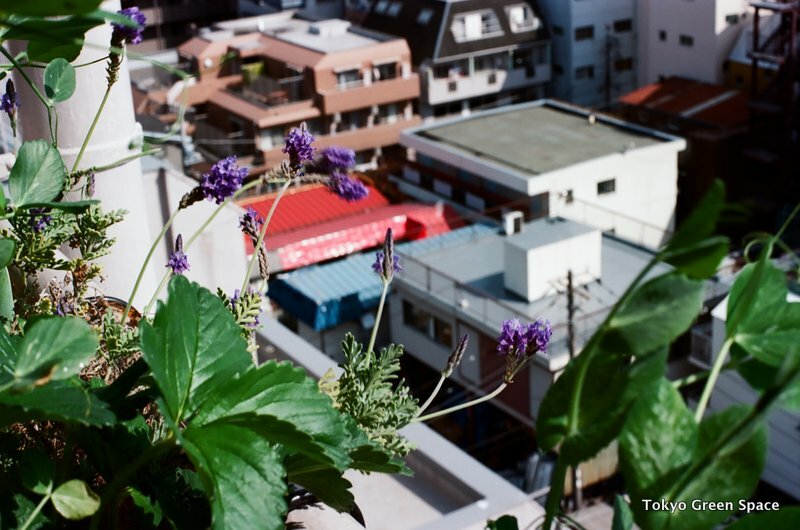 This balcony lavender attracts Tokyo butterflies. Thanks to Mr Bas Valckx, who works in culture and design affairs at the Netherlands embassy, last month I had the great pleasure of meeting Mr Ito Masaru, who has created Shibaura House as the headquarters of his advertising agency, Kohkokuseihan, and a new community space between Rainbow Bridge and Tamachi station in Minato-ku. The building, designed by prominent Japanese architect Sejima Kazuyo of SANAA and completed in the summer of 2011, is as stunning as one could imagine: floor to ceiling glass walls, each floor plate unique, a form that combines transparency, simplicity, and elegance. There’s a sizable roof and three outdoor areas, a rectangular balcony and two curvy, double height voids. But I was even more impressed by Mr Ito’s vision for work, community, and art. He kindly gave Bas and me a tour, which included rental areas, his company’s office, meeting spaces, and a ground floor cafe open to the public. Mr Ito is extremely knowledgable about urban planning, art history, and even permaculture. 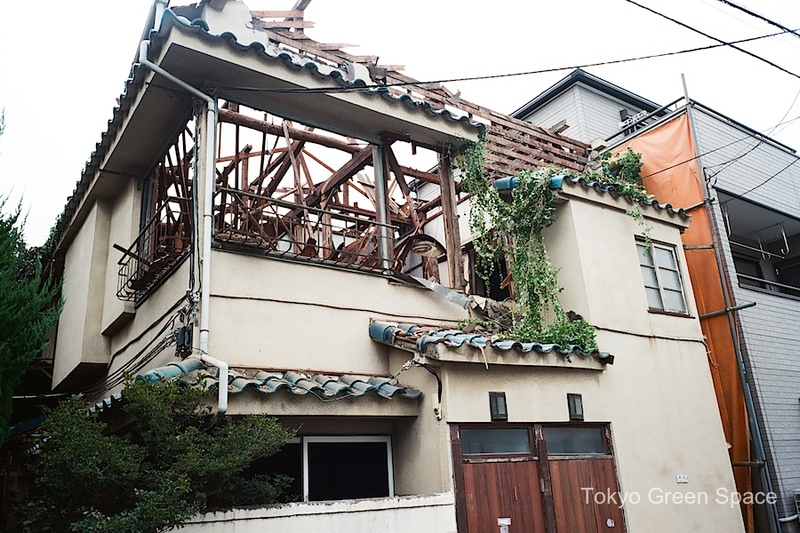 His reason for creating Shibaura House and his plans for its future are inspiring and unconventional. He told me that his motivation for creating Shibaura House was to create the very opposite of the advertising business that he runs. And while he is pleased with how the building turned out, he is eager now to make it more alive, with more soil, people, and activity. Too often, even in Silicon Valley, I have seen companies seek to wall themselves off from neighbors and outsiders. Global icons like Facebook, Google and Apple locate their employees in office parks, making their facilities off limits to non-employees and promoting secrecy over collaboration. I think Mr Ito’s bold vision suggests new ways to use real estate, to operate a company, and to become a vital part of local neighborhoods. The neighborhood context is very diverse and layered: close to canals and the Tokyo Bay, near a main water processing facility, and neighbors with a variety of architectural styles from post-war, 70s residential, to more recent projects. As Bas reminded me, the area is reclaimed land from Tokyo Bay from the Edo period. I’d love to see more plants, wildlife, and agriculture at Shibaura House. Things like bee hives, chicken coops, urban satoyama plants. It would also be great to see Shibaura House engage its neighbors with with local food, plants, and wildlife habitat connecting buildings and waterways with green walls, roofs, and sidewalks. I am eager to see how Shibaura House grows and takes shape in the coming years. Recently, Mukunoki Ayumi gave me a tour of Kuboco, the construction and roof garden company where she works in Shitamachi. She graduated from Nodai, where I am a research fellow. The meeting took place thanks to Edgy Japan‘s Yanigasawa Hiroki. I immediately recognized the building when I spotted the incredible wisteria that is trellised across one building and climbs to the top of the adjoining 8 story building, where it provides rooftop shade on a trellis structure. Mukunoki-san told me that the vine is just eight years old and very vigorous! Kuboco designs roof gardens and vertical gardens for commercial and retail buildings as well as residences. Since they are a construction company, they are able to combine garden design and maintenance with structural engineering, water-proofing, and retrofitting trellises for vines and vertical gardens onto older buildings. Mukunoki-san reports seeing a shift from roof lawns to vegetables in Tokyo. She attributes this to customers wanting less maintenance and greater value from their outdoor spaces. Kabuco has roof gardens on both of its buildings, one a more social space and the other full of experiments with soil depth and new vegetables. Kuboco is very hands-on in providing advice about how to build roof gardens and what to grow. Mukunoki-san explained that last summer she grew tumeric because one of her clients wanted to grow it. On my visit, I saw blueberries, carrots, onions, parsley and other food on their demonstration gardens, and admired how they are testing out what can grow in 5, 10, 20, and 25 cm deep soil boxes. And for a while Kuboco’s roof garden provides fresh vegetables to a local onigiri restaurant. She also introduced me to the Japanese term for “local food”: 地産地消 (chisanchishou, locally produced and locally consumed, with the first and third kanji being the word soil). The 8 year old wisteria looks like it’s been on this building for much longer. It blooms best when trained horizontally. I would love to try blueberries, too. It would be so satisfying to eat fresh blueberries, rather than the supermarket ones that have travelled from as far as Chile. A friend told me to check out this green “bus stop” between Kabukicho and Hanazono Shrine. This incredible vine providing shade for the sidewalk is no longer a bus stop, but is in front of Shinjuku’s ward office. As I’ve written before, the wards seem to be leading Tokyo Metropolitan Government and the national government in creating innovative green spaces on their properties. What’s great about this sidewalk awning is that it requires minimal space and maintenance, yet impacts thousands of people coming to the ward office, or just passing by on this busy street. Two very kind city workers involved with green space took time out to talk with me about the sidewalk, facade, and roof greening. The sidewalk awning is a combination of two hardy vines: nozenzakura (ノウゼンカズラ in Japanese or Campsis grandiflora in Latin) with orange flowers, which I have seen in my neighborhood blooming all summer. The other vine is akebi (アケビ, also called Akebia in English), which flowers and fruits. Wikipedia says that it is frequently mentioned in Japanese literature and evokes images of pastoral landscapes; it’s also considered an invasive in New Zealand and parts of the United States. 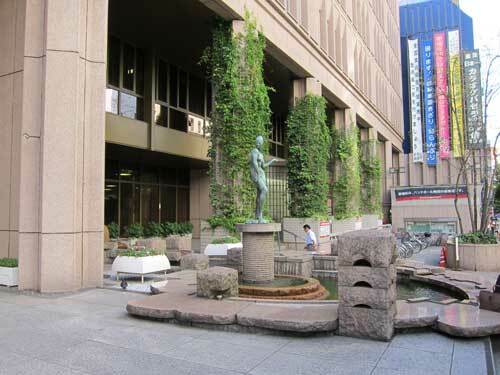 Here in the heart of Shinjuku, it’s a very attractive shade plant with the added bonus of having distinct seasons. It was nice to see that parts of the facade have vertical plantings, although a simple full facade retrofit would modernize and make more attractive the 1960s building. The city workers also showed off the roof garden, which has different areas including edibles, herbs, and water plants. It was sad that most of the usage seems to be a place for smokers to congregate. I wonder how they can make the space more attractive for non-smoking workers and neighbors. It would be cool to see a complete redesign of the entire usable surface of the ward office to eliminate the dead space. Too much of the facade is monotonous concrete with minimal pattern, and too much of the plaza in front and along the side is hard surfaces. A redesign could capture the imagination of residents, retailers, and office owners. People often complain that there space is too limited to have a garden. This amazing single family residence in Sendaji has a tiny front yard between the house and wall that separates it from the street. Yet they have managed to create an amazing mini-forest garden of nicely pruned trees. Some are in the ground floor soil, and others in pots on the three levels of balconies and roof. There are dozens of trees, including evergreen and deciduous. On our visit, the pines and azaleas were especially beautiful. I imagine this garden has been growing for at least ten or twenty years to reach this amazing fullness. So many people think that all they can plant are simple flower boxes, when vertical solutions can be so much more lush and interesting. This residential garden, discovered while visiting the famous restored Yasuda house across the street, is very inspiring. On a Nodai Garden Laboratory trip organized by Hattori sensei, I visited some amazing gardens and shrines, and stayed at a beautiful ryokan called Yoshiike. What I did not expect to see were these incredible moss roofs and walls in unexpected places. While I love designed gardens, I am also amazed at how nature can impose itself on our built environment, creating beauty in unlikely places. I like the idea of the garden extending itself into the everyday. Even mundane structures come alive when we let nature colonize our habitat. Famed architect Kuma Kengo’s new building, Tamagawa Takashimaya S+C Marronier Court, features cool roof gardens that jut out over the sides of the building on four levels. I am curious what the plants are, and how it will look as they cover the triangular frames. More photos on Designboom. In addition to Portland’s green streets, this Oregon city now boasts of an amazing retrofit for a federal building, the General Services Agency, featuring green fins. The vertical gardens will shade a 200 foot high wall in spring and summer, using rooftop graywater. This reminds me of Suginami’s giant green curtain, but perhaps even more ambitious. According to the architects, Cutler Anderson, the building aims to be one of the most energy efficient buildings in the United States, if not the the world. Vanessa Keith has a provocative article about urban reforestation. Rather than focus on new buildings, a small percentage of any city, Keith proposes rebuilding through a “clip-on” to existing urban structures and infrastructures. Keith considers roofs, walls, and highways as valuable surfaces that increase by factors of two (for in-fill structures) or six (for free standing structures) the total surface area of a city. Her clip-on ideas include green roofs, roof ponds, vertical gardening, waterfalls for cooling and power generation, wind bands, and more urban trees. I like how she connects urban solutions with rural deforestation, and considers government incentives and the potential role of large developers and community groups in creating a demonstration block in New York City.